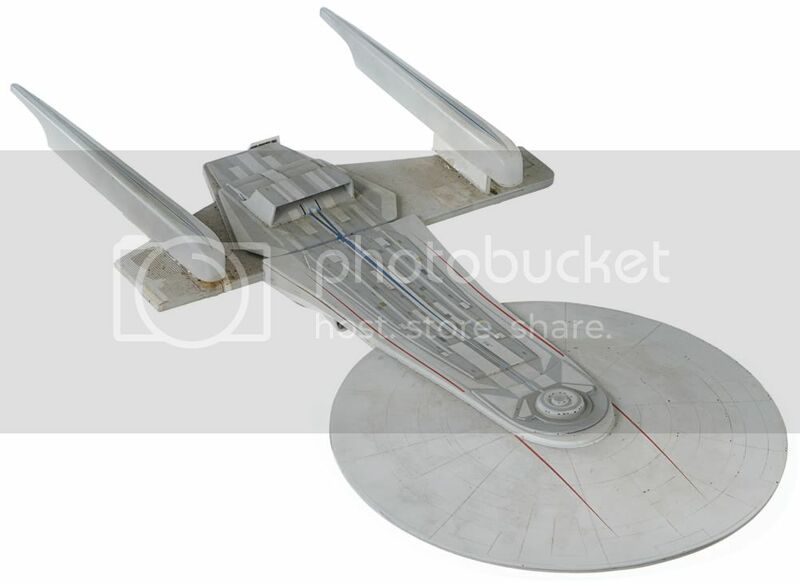 So here is the second part of the Propworx Star Trek Auction II review. This time we analyze the prop sales. Now, overall, Star Trek props have settled into a nice rhythm. We tend to know the ranges of most items, and none of them are too pricey, except when you deal with ship models and most of those aren't coming back up for sale. 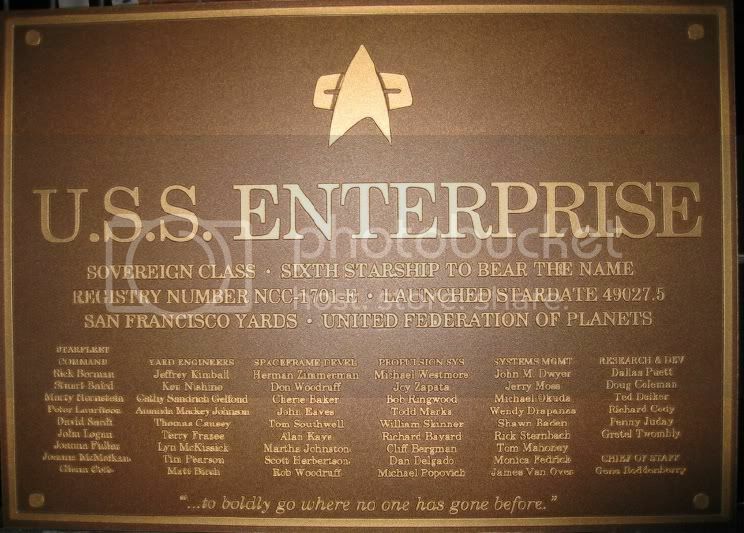 While not technically a prop, Lot 45, the Excelsior Study model, was a beautiful piece and from the Okudas personal collection. At $ 1,400 it was a pretty good buy in my book. There were a bunch of weapons in this auction and they all went at reasonable prices. The TNG Cobrahead Phaser at $ 1,800 was about right. I am not sure if there is any perceived difference between a light weight roto-cast resin Phaser and a heavier one, but I think all of these type of Phaser in the $ 1,500 - 2,000 range is pretty standard now. The Nemesis Dolphin Phaser at $ 2,000 proves this too. We don't see many of this type of Phaser and I won this for my personal collection (the only item I really wanted!). If you are a Starfleet weapon completest like I am, I think you will find this one of the harder ones to obtain. 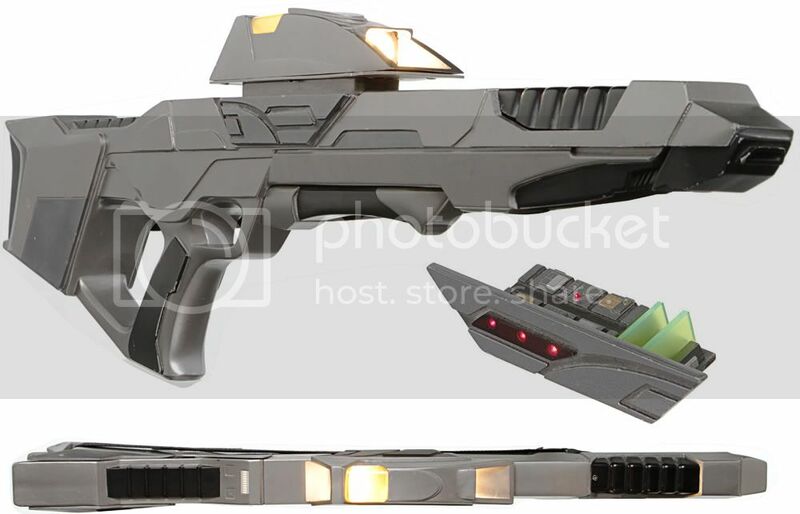 The First Contact Phaser Rifle was production made but never screen used. Still, it hit a strong $ 4,000, which is because this was the type of rifle that Picard used in his scene in his ready room with Lillie. This one is fully lighted and so a great display piece. The rubber Klingon DIsruptor at $ 1,600 was about right. 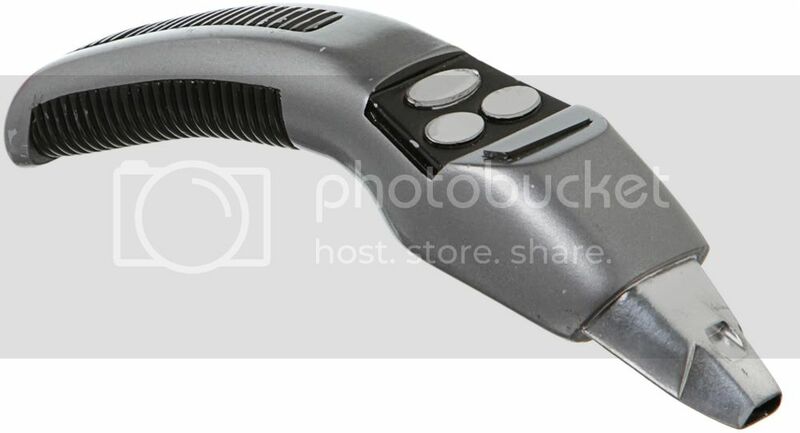 This is the iconic Klingon disruptor weapon. If you collect weapons, one of these needs to be in your collection. SO I think, even with Buyer's Premium, this is a good deal at under $ 2,000. The Enterprise version continues not to do well, as this one only hit $ 1,000 with a holster. This is surprising and I see some good potential in these long term. I have one and think if you collect Klingon Weapons, you need one of these. So buy now while prices are low. The Bajoran Pistol was a rubber stunt I picked up at last year's Profiles in History auction for $ 500 and got $ 750 here. So I was happy as I had recently won a resin one from Profiles. I am not big on having to have a hero prop for my weapon collection, but I do want resin over rubber, and so was happy to upgrade here and make a couple bucks. 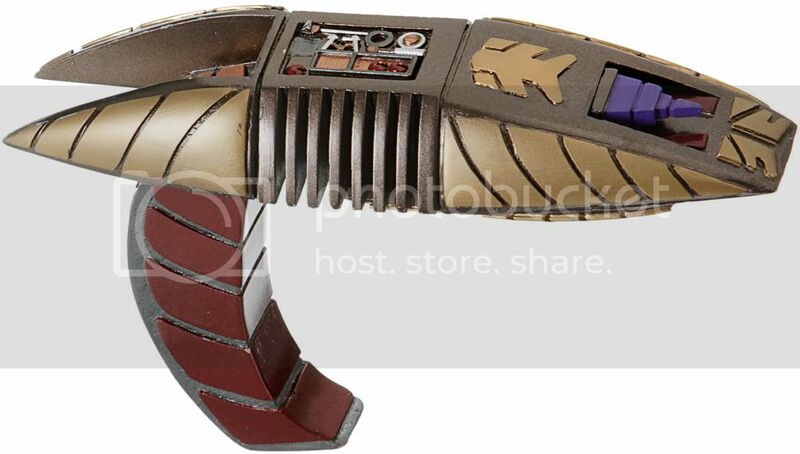 The Cardassian Phaser was a beauty and at $ 1,200 pretty fairly priced. These display very well and so I think the winner got a nice piece. There were 3 Tricorders for sale in this auction, and the screen used ones went very reasonably, while the replica went high! Go figure! Lot # 68, the hero medical Tricorder went for only $ 2,750. This goes along with the recent trending down of Tricorder prices. 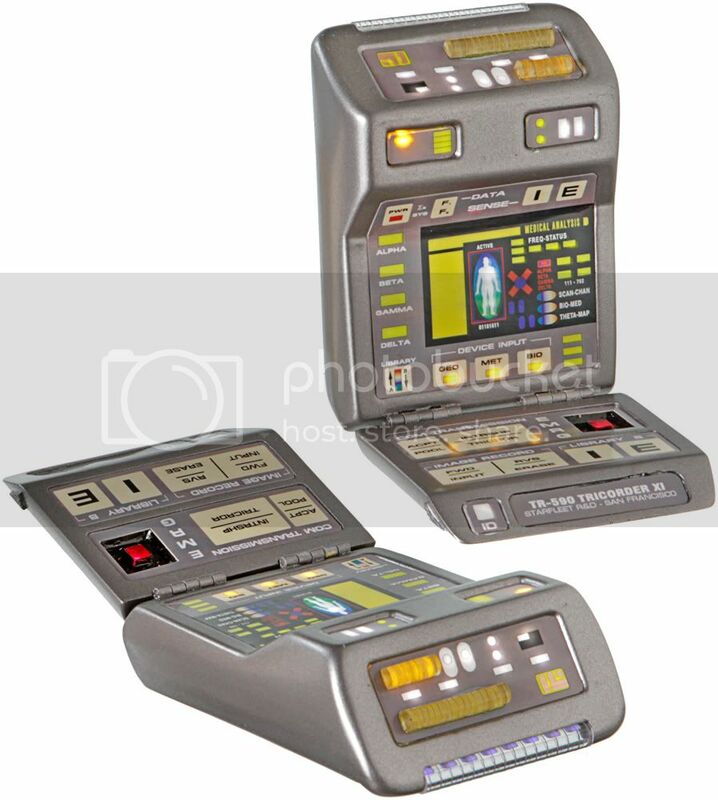 The recent sale at Profiles of a Mark VII Tricorder for only $ 2,250 marks an interesting downturn for Tricorders that this sale continues. Lot # 69 was the solid resin Tricorder with holster that went for $ 1,700, which was reasonable for a nice, very displayable piece. And Lot # 70, the EFX replica, went for a very strong $ 800. That was a shocker. The screen used comm badges went for $ 650, 500 and 550, which pretty much sets the market for these items. The Nemesis Red PAD and Silver PADD went for $ 1,200 and $ 1,000 respctively. And the best prop in the rest of the auction was the Defiant helm console, which came up for auction again after selling in the first Propworx Star Trek auction. Now there are a few more props of note and I will cover them in my next post on the auction! Cherie Baker was one of two art directors working with Herman Zimmerman on Star Trek: Nemesis. She contacted me as she had a couple of items for sale. Please contact her directly if you are interested. She can be reached at artqueenla@gmail.com. Well, another significant costume from the Christie's Star Trek auction is up for sale on eBay. And it appears the seller just took it to the local eBay store (those places that will sell your item on eBay for a %) which is a VERY bad idea. 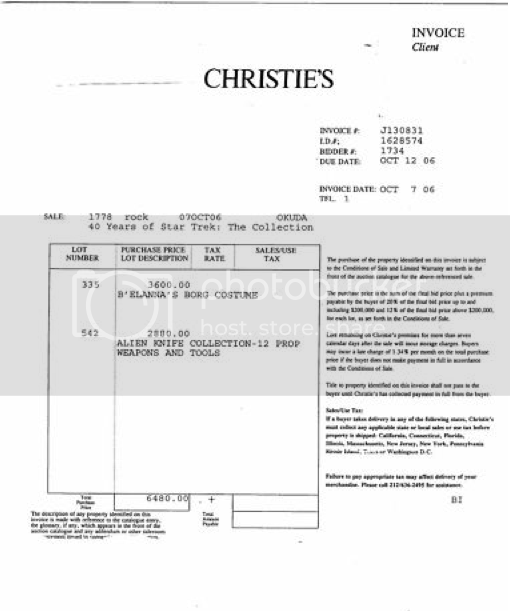 However, seller was smart enough to have saved the original invoice as well as providing good pics and a copy of the item in the Christie's catalog. None the less, here is some free advertising for that seller! 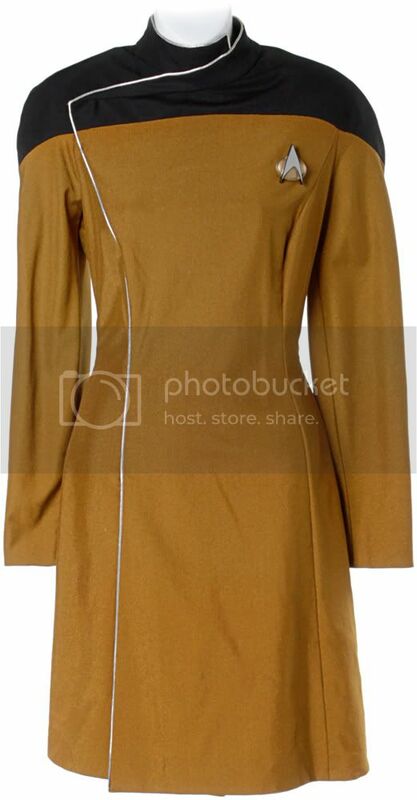 Own an awesome piece of Star Trek history - the original B'Elanna's Borg Costume. 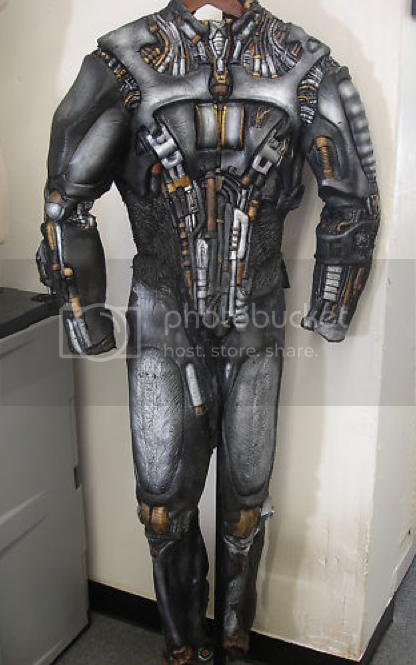 Two-piece costume with jumpsuit and jacket made from cast latex painted as biochemical hardware and a pair of Borg boots with label inscribed "Roxann Dawson". Designed by Robert Blackman and worn by Roxann Dawson as B'Elanna Torres in Borg from in "Unimatrix" in Star Trek: Voyager. It is in good condition, but not perfect. It has some wear, minor missing pieces of rubber and paint loss. We had to carefully pry the costume apart as it has been in storage since it was shipped from Christie's in 2006 and some of the rubber was "stuck" together. However, we were able to separate it without causing any real damage. Well, the Star Trek auction was a big success from a lot of perspectives. Certainly the staff at Propworx is happy with the auction. We have over 300 bidders from 18 countries bidding in this auction. The auction totaled over $ 156,000 in sales. 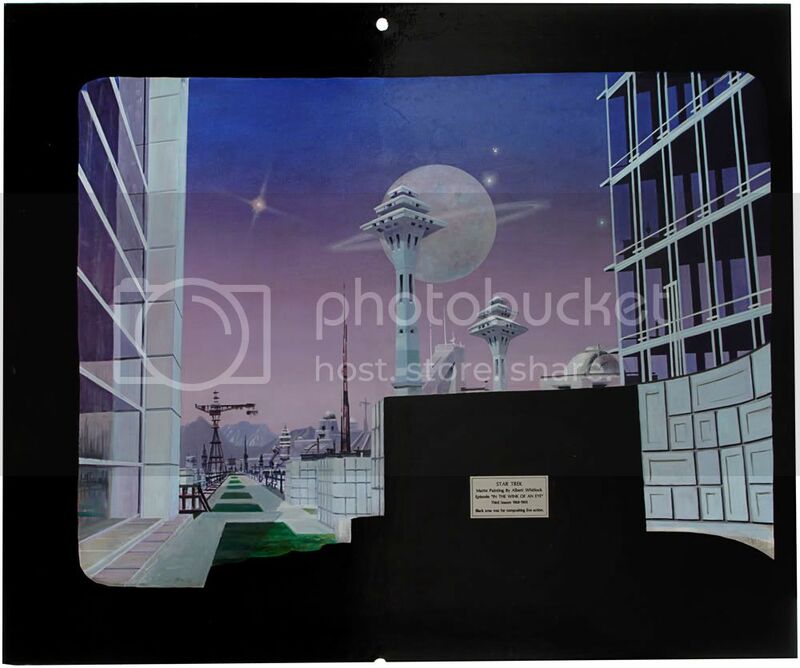 From the outset the auction was strong with the "Menagerie" Matte painting going for $ 12,000. OK, so it isn't a costume, and I titled this blog "The Costumes". Give me a break! :-) But we made this the first item in the auction because it deserved to be first. Plus, we had a few bidders who we knew would also bid on the Red Dress, and we wanted to get this one out of the way, so the losing bidders could know they could bid on the red mini-dress. 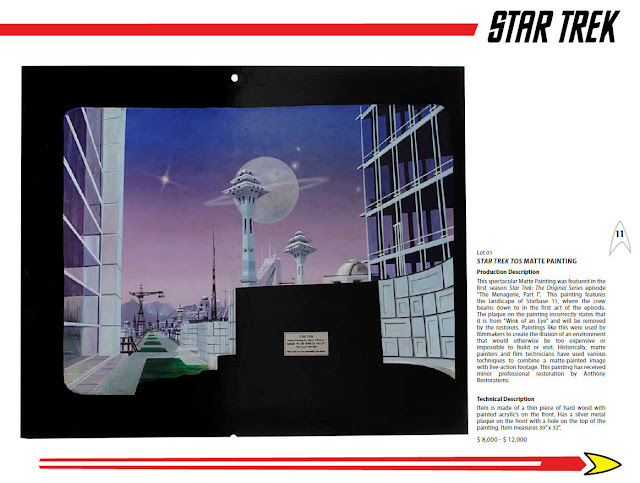 The Matte painting is the first TOS matte painting to be offered by an auction house since this was sold over 15 years ago. Now, when writing this section, I realized that most of the highest selling costumes were from my collection. I really cleared out the closet and trimmed down my collection a great deal. And I liked it too because a lot of my friends from the Star Trek Prop, Costume & Auction Forum won these costumes and they will now bring joy to them in their collections. The Celeste Yarnell red mini-dress uniform went for $ 8,000. I could have seen this going for a bit more, but none the less both buyer and seller were happy. 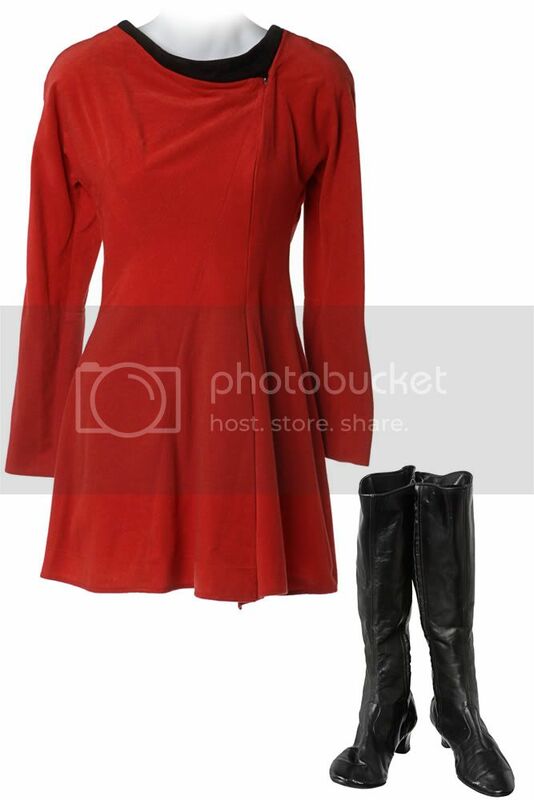 The dress was offered with TOS women's boots, which one rarely sees. In fact both items went to Arnaud from France, a top collector in Europe and Propworx very first customer! It was Arnuad that bought the Battlestar Galactica Viper in 2008. when we had just gotten up to Vancouver. So we were happy that he got these very rare and precious Star Trek artifacts! The beginning of the auction also had two amazing TNG costumes in the Worf Jumpsuit and the Tasha Yar dress uniform. Both went for identical $ 3,750 bids. The Worf went for $ 3,000 at Christie's, and although this wasn't that exact costume, it was identical, though without rank pins. The Yar was one of the first costumes I got back in 2006. 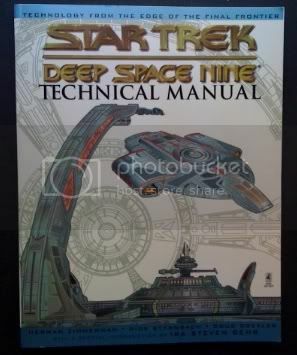 After the Christie's Star Trek auction, the winner of the Lot that had this and Tasha's jumpsuit, wound up winning a Klingon Costume for almost $ 10,000. he needed to sell the Yar's and I was happy to oblige. I paid $ 1,500 each back then, so I did well in this auction off of it. It is a beautiful costume, but I have her jumpsuit, which I find more appealing. When I had my home in Atlanta, her jumpsuit was displayed next to the Carol Marcus, which made a truly awesome "Women of Star Trek" display. There are actually boots that go with this that were misplaced in the move. When I find them I will contact the winner. Lot # 13 was Dr. Bashir's Future uniform from "The Visitor". First off, "The Visitor" is one of the best Star Trek episodes EVER of any version. It is the "Field of Dreams" of Star Trek, because if you are a guy, you will cry. This is all about Jake and his Dad, and Tony Todd gives an emmy worthy performance. So go watch it! Now, why did I sell this? Well, I bought The Doctor version of this costume from "Endgame" and that gave me all 4 major "Endgame" characters, Admiral Janeway, The Doctor, Miral Paris and Harry Kim. So I have all 3 section colors, plus the Admiral is different in its trim. And I wanted that selection so I could do a cool display. So I really didn't need the Bashir. 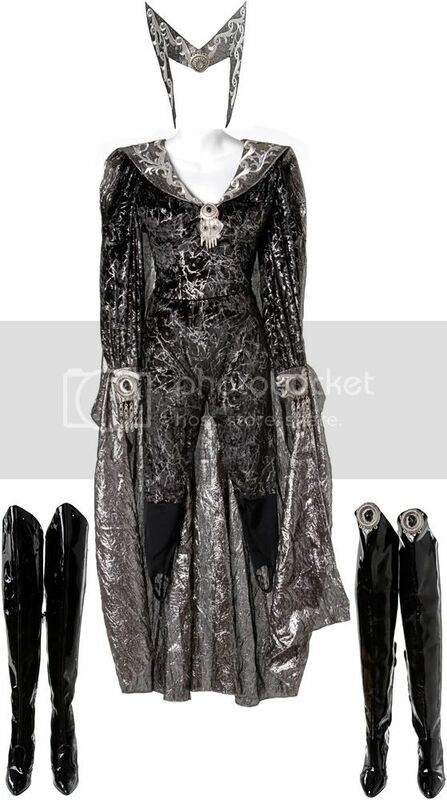 It is a beautiful costume though and went for a reasonable $ 2,100 with a future combadge! There were 3 "Captain Proton" costumes in the auction. Of course, they all belonged to me. Last summer, when I didn't get the Captain Proton laser gun from the Profiles in History auction, I kind of lost my interest in the Captain. Plus, now that I live in California and have about 1/3 the space I used to, I have to trim my collection down as I simply do not have the space to display everything. And for me a costume not displayed is a major problem! So I decided to sell these items, and I am happy they found good homes. The Lonzak costume went for a very reasonable $ 600. It is an amazing costume with lots of cool parts. The Delaney Sisters "Demonica" and "Malicia" costumes went to the same buyer overseas. I am happy that is the case, as I hope the buyer gets two female friends to wear them to a con and then show off photos! The costumes are really beautiful with velvet bodysuits and intricate details. The final costume from my collection that I am highlighting here, is the Keith Carradine "A.G. Robinson" costume from the Enterprise episode "First Flight". Now this is a standard "Enterprise" blue jumpsuit, in command gold, and this one even had a pair of boots. Though why they are hiking boots I do not know! But this was a great episode and I really liked it. Carradine is of course an accomplished actor and pulled his brash character off well. I thought this was an important costume when I got it and I think someone got a great deal as this costume only went for $ 1,400. In Starfleet history, AG Robinson was the first human to break the Warp 2 barrier. Well, that is all for this entry. I will have Costumes Part 2 up tomorrow! Well, it has been a CRAZY month of May as we moved the Propworx offices to a smaller and much nicer facility. There is a reception area now and the walls are lined with my best Sci Fi prints and art. We will be having an open house at the end of the month and you will all be invited! 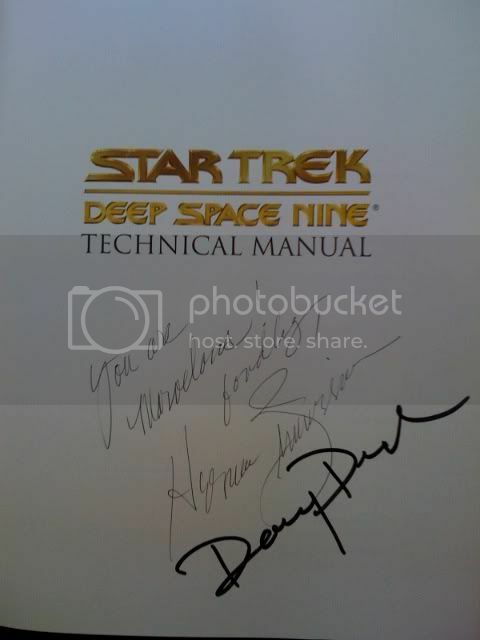 In the mean time, this Saturday is the Second annual Propworx Star Trek Auction! Yeah, let's face it, this needs to be an annual event! We already have a ton of stuff for auction # 3! But in the mean time, you need to download the beautiful PDF catalog. You can do so here. While we didn't print a catalog this time (we simply don't sell very many and we don't do enough business to eat the production and printing costs), we did do our usual stellar effort in putting a catalog together. A PDF only catalog allows us a lot of freedom too. We don't worry about page counts and other limitations. We can use more photos and make them bigger. We are just learning how to best do a PDF only catalog, but we hope we will continue the tradition of the best auction catalogs in the business.